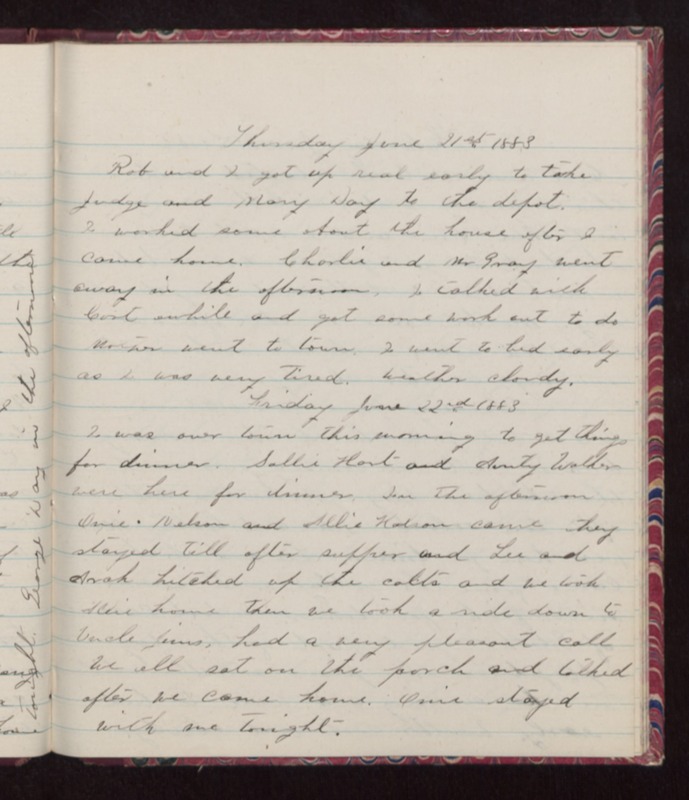 Thursday June 21st 1883 Rob and I got up real early to take Judge and Mary Day to the depot. I worked some about the house after I came home. Charlie and Mr Gray went away in the afternoon. I talked with Curt awhile and got some work out to do Mother went to town. I went to bed early as I was very tired. Weather cloudy. Friday June 22nd 1883 I was over town this morning to get things for dinner. Sallie Hart and Aunty Walker were here for dinner. In the afternoon Onie Nelson and Allie Halson came they stayed till after supper and Lee and Avah hitched up the colts and we took Allie home then we took a ride down to Uncle Jims, had a very pleasant call We all sat on the porch and talked after we came home. Onie stayed with me tonight.